When you import tasks, all tasks that are assigned to you that fall within the date range defined in PWA are imported. By default, they are places directly on your calendar as free appointments. Each appointment name is the combination of the task name and the project name. (Displayed as task name � project name, for example Software Localization is project name and Finalize cost analysis is the task name, you will see the appointment as Finalize cost analysis � Software Localization). NOTE: Prior to import the tasks, you must have published assignments by PM on PWA. NOTE: PMs should use Collaborate option to publish assignments from project plan. Please remember to publish the assignments can be possible with only enterprise resources. Access the PWA home page by entering URL on Internet Explorer. You can set tasks to import and update automatically at regular intervals by day, week, or month. 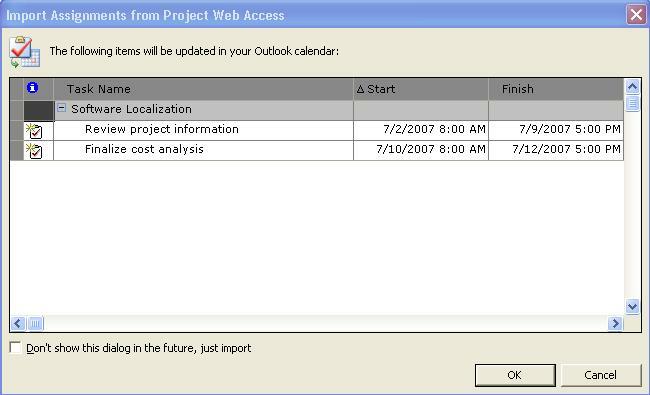 From Outlook, you can also change the date range for tasks that you import. 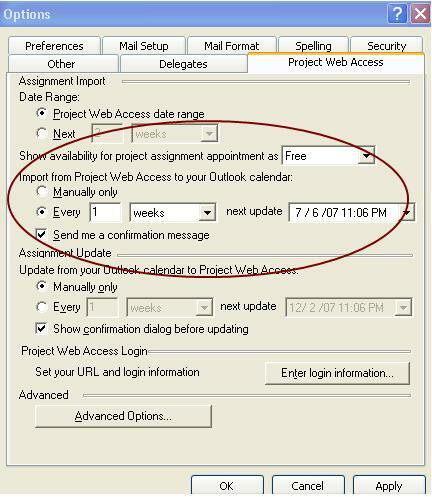 Review the new assignments in the �Import Assignments from Project Web Access� dialog box, and then click �OK�.